The Japanese Pavilion at Milan Expo 2015 reflects the country’s various sustainability efforts in the field of agriculture, forestry and fisheries as well as food. The Pavilion, named ‘Harmonious Diversity’, reflects the knowledge and skills that are found throughout “Japanese food” and “Japanese food culture” that will contribute to the solution to issues common to all humankind and cultivate approaches toward a diverse and sustainable society of coexistence in the future. One of the largest pavilions of any participating country, it joins a select group of popular pavilions that always have a long waiting line. 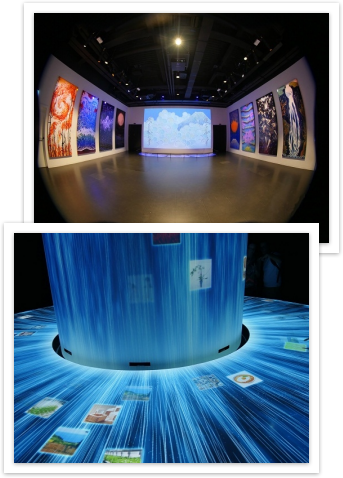 Panasonic technology is used to create peaceful, uplifting and engaging exhibition spaces throughout the pavilion. The first room, entitled ‘PROLOGUE’, describes the importance of mankind coexisting with nature, providing images and illustrations to express this theme. Novel calligraphic works and paintings are projected on to a large screen and draw visitors into a journey to a remote eastern island nation. Images are displayed over the entire surface of one wall, so Panasonic’s PT-DZ870 1-Chip DLP™ projector is used to take advantage of the high brightness and high resolution, maintaining clarity even in a comparatively bright space. With no backup projector it was essential that the Pavilion chose Panasonic. The high reliability of the projectors meant there was minimal maintenance or down time. In the ‘HARMONY’ room, rural landscapes from the four seasons are projected on the walls and free standing ‘lily pads’ to give viewers a total spatial display. In order to project the images all over the room, a total of 20 Panasonic PT-DW640 1-Chip DLP™ projectors were used in conjunction with mirror reflection. The compact and lightweight body enables the projectors to be installed in enclosed spaces. What’s more, high precision edge blending and digital mapping helped achieve a seamless projection across the large surface area of the lily pads. The most popular installation is the ‘Diversity Waterfall’, which consists of a central column surrounded by a table. Visitors are asked to download an app and place their mobile phone in to a special recess in the table. They are then able to interact with the content and add the various images from the diversity waterfall to the phone. A total of ten PT-DZ870 projectors were used: four on the pillar and six on the table. The images projected onto the table are superimposed onto an image of flowing water, so require high resolution. The PT-DZ870 excels in colouring performance, and offers high contrast, providing a remarkable projection of the blue waterfall in the dark space. The ten projectors were combined using geometric adjustment for a seamlessly edge-blended image across an unusually shaped structure. The “INNOVATION” area wove an emotion packed story of the various solutions from Japan provided in response to the environmental problems faced by our planet. A total of three PT-DZ870 projectors were used: one on a central circular screen and two for the side screens. The PT-DZ870 provides superb colour reproduction, adding credibility to the curved effect when images of the earth are projected on the flat and circular screen. The "MAIN SHOW" is a restaurant-style theatre. Each visitor can ‘order’ using a touch screen media table with video display. 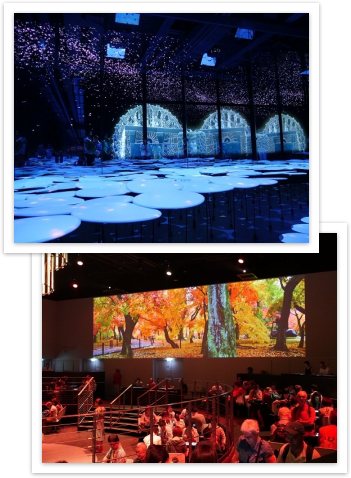 A total of five PT-DZ13K 3-Chip DLP™ projectors are used to create wall to wall video screens and to animate a central stage. Because of the size of the screens, the image had to be both bright and high in quality. For this reason, 3-Chip DLP™ projectors were used for this application. For projects of this scale, the cost-effectiveness of Panasonic’s projectors, in terms of low power consumption and compact and light weight bodies, helps to dramatically reduce the costs of creating large-scale projection shows. Isao Ando, Deputy Pavilion Director, said, “Japan has always emphasised the need to coexist with nature, leading it to create a rich variety of foods and a gourmet culture, as well as many beautiful landscapes. Japan Hall is designed to let everyone experience these qualities.